There’s a bit of sugar attached to your billion-dollar biotech product. Omitting the sugar (fucose) can help the product work better, Emory immunologists think. Fucosylation is the red triangle on this diagram of the carbohydrate modifications of antibodies. Adapted from KTC Shade + RM Anthony, Antibodies (2013) and used through Creative Commons license. Many drugs now used to treat cancer and autoimmune diseases are antibodies, originally derived from the immune system. A classic example of a “therapeutic antibody” is rituximab, a treatment for B cell malignancies that was FDA-approved in 1997. It has been responsible for billions of dollars in revenue for its maker, pharmaceutical giant Roche. 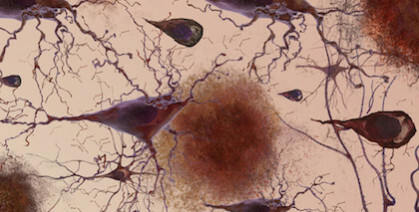 Researchers at Emory Vaccine Center previously observed that in a mouse model of chronic viral infection, a traffic jam inside the body limits how effective therapeutic antibodies can be. One of the ways these antibodies work is to grab onto malignant or inflammatory cells. One end of the antibody is supposed to bind the target cell, while another is a flag for other cells to eliminate the target cell. During a chronic viral infection, a mouse’s immune system is producing its own antibodies against the virus, which form complexes with viral proteins. These immune complexes prevented the injected antibodies from depleting their target cells. 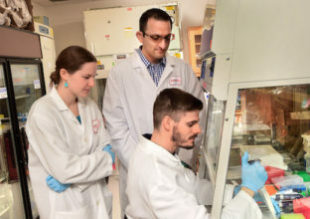 In a recent Science Immunology paper, postdoc Andreas Wieland, Vaccine Center director Rafi Ahmed and colleagues showed that antibodies that lack fucosylation have an enhanced ability to get rid of their intended targets. Fucosylation is a type of sugar modification of the antibody. (It is the red triangle in the diagram, provided by Wieland.) 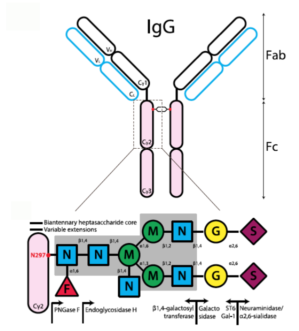 When it is not present, then the “flag for removal” region of the antibody can interact more avidly with the Fc gamma receptor on immune cells. Thus, the introduced antibodies can compete more effectively with the antibodies being produced by the body already. What timing! 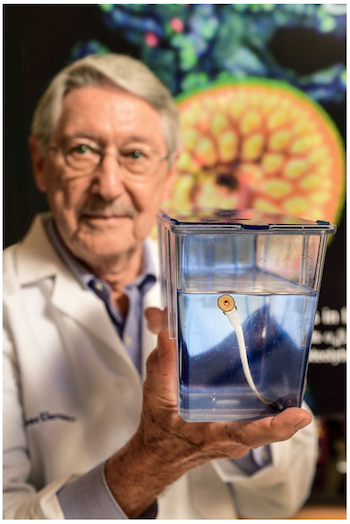 Just when our feature on Max Cooper and lamprey immunology was scheduled for publication, the Japan Prize Foundation announced it would honor Cooper and his achievements. Cooper was one of the founders of modern immunology. We connect his early work with his lab’s more recent focus on lampreys, primitive parasites with surprisingly sophisticated immune systems. Molecules from animals with exotic immune systems can be big business, as Andrew Joseph from STAT News points out. Pharmaceutical giant Sanofi recently bought a company focused on nanobodies, originally derived from camels, llamas and alpacas, for $4.8 billion. Lampreys’ variable lymphocyte receptors (VLRs) are their version of antibodies, even though they look quite different in molecular terms. Research on VLRs and their origins may seem impractical. However, Cooper’s team has shown their utility as diagnostic tools, and his colleagues have been weaponizing them, possibly for use in cancer immunotherapy. CAR-T cells have attracted attention for dramatic elimination of certain types of leukemias from the body and also for harsh side effects and staggering costs; see this opinion piece by Georgia Tech’s Aaron Levine. Now many research teams are scheming about how to apply the approach to other types of cancers. The provocative idea is: replace the standard CAR (chimeric antigen receptor) warhead with a lamprey VLR. Tab Ansari’s research at Emory/Yerkes on how an antibody treatment can push monkeys infected with SIV into remission was published in Science last year. At that time, Ansari told Lab Land about follow-up experiments to probe which immune cells are needed for this effect, which surprised many HIV/AIDS experts. According to Fauci’s slides, which are available online, there was a transient rebound in viral load with the CD8 alpha antibody and to a small degree with the CD8 beta. This suggests NKTs and NK cells are making a contribution to the observed control of SIV replication, but a role for CD8 T cells cannot be ruled out. For comparison, a study from Guido Silvestri and colleagues at Yerkes published in 2016 found that treating SIV-infected monkeys with anti-CD8 antibodies, without stopping antiretroviral drugs, resulted in a rebound in virus levels. [They used ultrasensitive assays to detect the rebound.] However, the Yerkes team only used antibodies to the CD8 receptor alpha chain. We are looking forward to the “Immunology and Evolution of Influenza” symposium next week (Thursday the 25th and Friday the 26th). The symposium is taking place in Whitehead Auditorium in the Whitehead Biomedical Research Building. Talks from flu researchers based around the country, followed by a poster session, are on Thursday. From Emory, Jacob Kohlmeier and Rafi Ahmed are speaking Friday morning. Organizers are asking for registration by Friday the 19th. The symposium is jointly sponsored by the Center for Inference and Dynamics of Infectious Diseases, funded by NIGMS, and the Center for Modeling Immunity to Influenza Infection, funded by NIAID. At the American Association for the Advancement of Science meeting in Boston last weekend, Emory Vaccine Center researcher Mark Mulligan presented some limited findings on immune responses in Zika-infected humans, who were returned US travelers or expatriates. The results were intriguing, despite the small number of study participants: five, two of whom were pregnant. Detailed information has not been available about immune responses against Zika in humans, especially T cell responses. *All five seemed to have a hole in their immune systems – functional antiviral “killer” CD8 T cells were rare, despite activation of CD8 T cells in general and strong responses from other cell types. *Cross-reactive immune responses, based on previous exposure to dengue and/or yellow fever vaccine, may have blunted Zika’s peak. Important immune alarm cells — dendritic cells — are fighting Zika virus with an arm tied behind their backs, scientists from Emory Vaccine Center report. Police procedural television shows, such as Law + Order, have introduced many to the Internal Affairs Bureau: police officers that investigate other police officers. This group of unloved cops comes to mind in connection with the HIV/AIDS research published this week by Rama Amara’s lab at Yerkes National Primate Research Center and Emory Vaccine Center. 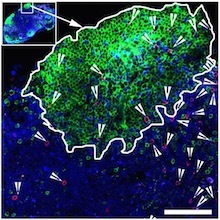 “Killer” antiviral T cells (red spots) can be found in germinal centers. The green areas are B cell follicles, which HIV researchers have identified as major reservoirs for the virus. Image courtesy of Rama Amara. HIV infection is hard to get rid of for many reasons, but one is that the virus infects the cells in the immune system that act like police officers. The “helper” CD4 T cells that usually support immune responses become infected themselves. For the immune system to fight HIV effectively, the “killer” CD8 antiviral T cells would need to take on their own CD4 colleagues. As they succeed in clearing a viral infection from the body, some virus-hunting T cells begin to stick better to their target cells, researchers from Emory Vaccine Center and Georgia Tech have discovered. The increased affinity helps the T cells kill their target cells more efficiently, but it depends both on the immune cells’ anatomic location and the phase of the infection. The results were published this week in the journal Immunity. After the peak of the infection, cells within the red pulp of the spleen or in the blood displayed a higher affinity for their targets than those within the white pulp. However, the white pulp T cells were more likely to become long-lasting memory T cells, critical for vaccines. 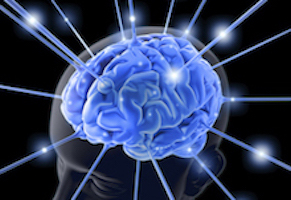 “These results provide a better understanding of how memory precursor populations are established and may have important implications for the development of efficacious vaccines,” the scientists write. In the mouse model the researchers were using, the differences in affinity were only detectable a few days after the non-lethal LCMV viral infection peaks. How the differences were detected illustrates the role of serendipity in science, says senior author Arash Grakoui, PhD. Typically, the scientists would have taken samples only at the peak (day 7 of the infection) and weeks later, when memory T cells had developed, Grakoui says. In January 2014, the weather intervened during one of these experiments. Snow disrupted transportation in the Atlanta area and prevented postdoctoral fellow Young-Jin Seo, PhD from taking samples from the infected mice until day 11, which is when the differences in affinity were apparent. Seo and Grakoui collaborated with graduate student Prithiviraj Jothikumar and Cheng Zhu, PhD at Georgia Tech, using a technique Zhu’s laboratory has developed to measure the interactions between T cells and their target cells. Co-author Mehul Suthar, PhD performed gene expression analysis.